Moving is hard, and the overall process exhausting. Simply preparing to move is an overwhelming task. I’ve moved a lot, and know this too well. The last thing anyone wants to do is add one more task to the endless lists. Especially one that can be a big undertaking, such as decluttering before relocation. And let’s face it, you’ll need to create another list for decluttering. Depending on your moving timeframe, there may not be a lot of time available to declutter. On the other hand, sorting and decluttering before relocation can reduce the time needed to pack and unpack, as well as your moving expenses. Another benefit of decluttering is that it can also decrease your level of stress. When you finally get past the chaos of moving and into the nesting phase, imagine being in your new home, surrounded by only your favorite things. Or as Marie Kondo would say, the things that spark joy. Imagine having fewer boxes to unpack and things to put away. We had a lot more stuff, clutter, until we started moving (that story here), and having a decluttered home feels calm and inviting, much less stressful, to me. To declutter in a methodic, less chaotic way before moving, schedule and block off time so that you can move quickly and with intention. The best approach depends on how much time you have, the size and number of rooms in your current home. There is no one approach fits all to decluttering before relocation. The most important factor is which feels best to you: most comfortable, fast and/or easy. Review how much time you have to declutter and plan out how you will move through your house and when. Decluttering while you pack is an option, too. I find that having a plan first keeps me focused and works best. Lean into the mess you’re going to make while decluttering. The mess means you’re making progress. Lean into the process, as well. You will probably have some emotions surface around decluttering and moving. What your feeling is normal (read more here). Remember the more stuff you move with you, the more expensive your relocation costs will be. And more stuff requires more of your time to unpack and put it all away. Think about your new home and space. How will you be using it? How do you want to feel in the new space? Which items will help you use the space properly and help you feel a certain way: comfortable, cozy, active, peaceful, joyful or whatever feeling you desire in the space? Involve your family in this process. Consider who will want to go through their own things, especially if you have teenagers. Share with your children how donating helps people be able to purchase things at a much cheaper cost and keeps items out of landfills. Think about what you want or need to take with you, and what you haven’t used or worn in the past year. Also consider again about how much room you have and time you want to spend unpacking, sorting, or possibly donating later. Chances are good that you use less than what’s stashed aside. Don’t forget to go through drawers, too. Desks, dressers and kitchen. Dining room hutch and side tables. And especially those junk drawers. On your first walk through of your entire house, you’re going to declutter trash and items that can be recycled. Start with 2 garbage bags or boxes, one each for trash and the other for recycling. Have more on hand because these will more than likely fill up. Then go through the house a second time for all items in good condition that can be donated or given away. While it’s wonderful to pass items on to friends, it’s understandable if you don’t have the time and energy to sort and deliver. Donating is sometimes easier. The second option to decluttering is to go through each room one at a time with specific bags or boxes for trash, recycle and donate/give away. If you go this route, pull aside what you use first, what you want to keep and take with you, and evaluate what’s left. It’s important to know your local recycling guidelines. What can be recycled varies among towns and counties. One example is that the town next to ours accepts broken plastic toys. Please always confirm first. Wire hangers can be returned to the dry cleaner. Check your local recycling for electronics. If you have items to donate, look for a nonprofit that is meaningful to you. When I find a charity or cause that I want to support and they take donations of household items and clothing, I’m more likely to donate more. I’m likely to lose that “just in case I need it” mentality that I embraced for so long. Donations are also tax deductible. Fire or police stations may take stuffed animals. Habitat ReStore and Goodwill will take your tools. Best Buy will take game consoles. Donating is now a habit, part of my routine. I’m now in the habit of donating seasonally. My preference is to donate, rather than sell, and it’s faster and easier, too. Living in an uncluttered home with open space gives me a lighter, happier feeling, especially when I walk in the door. Having an entryway with space to put things down makes settling in more comfortable. I also find that uncluttered space gives me room to more easily clear my mind and focus, opening me up creatively when it comes time to write or brainstorm about a project. One last benefit (and shameless promotion) to decluttering before moving is that you’ll have more time to take Relocation Recovery. 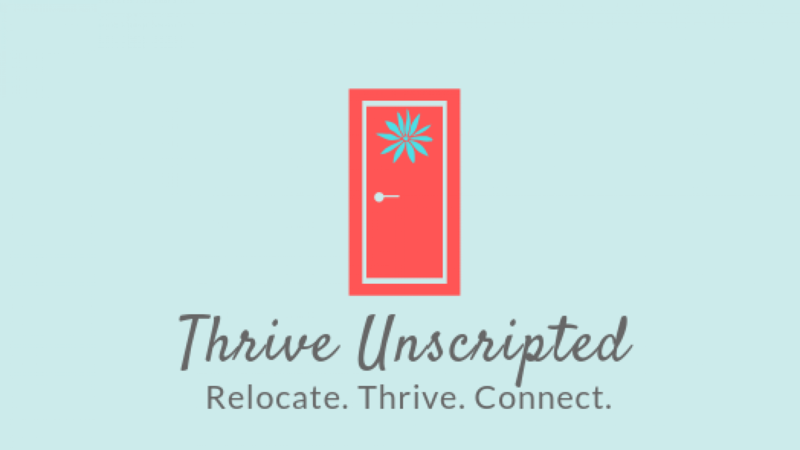 It’s an affordable, self-paced course that’s a fantastic guide to helping you settle in, explore and connect faster in your new place. More information can be found here and a direct link to the course here.